The best advocates for a car or truck are often the ones who’ve been in a crash in one and survived – it’s impossible to form a stronger emotional bond with a vehicle than experiencing one sacrifice itself in order to save your life. Walk away from a big crash, survey the damage, and you realize just how strong, and how sophisticated, modern vehicles are – and where that expensive engineering really comes into play. Even in that context, my Porsche Cayenne crash story is a pretty good one. It was August 2007, and I was sitting in the right passenger seat of a race-prepared Cayenne driving across the Gobi desert. It was late in the afternoon, and we were on the 13 day of Transsyberia Rally, a 14-day off-road rally raid that had started in Moscow’s Red Square and taken us across all of Russia, and over the last couple of days, deep into Mongolia. In the driver’s seat was Kees Neirop, an ex-Porsche factory Le Mans driver, the only Canadian with his name on a car in the Porsche Museum. Dust was flying everywhere, I had my head buried in the pace notes, and…we basically drove off a tall ledge at 80 km/h. Kees and I joke about it now – whether it was his driving, or my navigating that put us there – but the net result is that our Cayenne barrel-rolled three or four times, landing on its passenger side, and relieving itself of its major mechanical bits in the process. The engine and transmission landed a hundred feet away, there were body parts strewn all over the down-slope of the hill we’d just flown off, and our stuff was everywhere. But we were fine. After gathering our wits about us, Kees and I were able to climb out of the destroyed truck, walking away from a scene that looked more like a plane crash than a car crash. It was the end of our rally, but we’re both still here to tell the story. 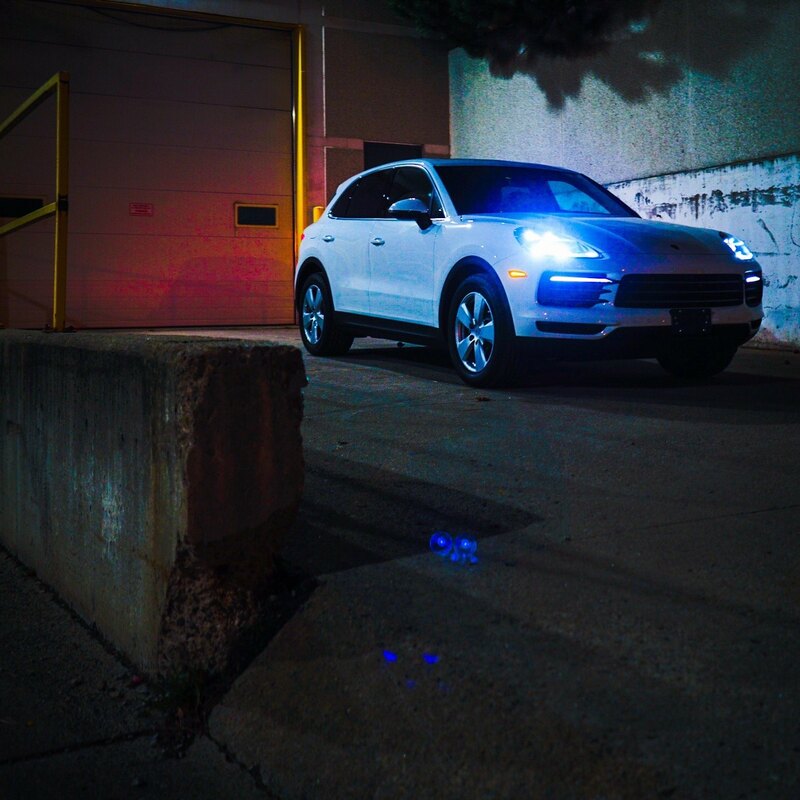 Those thirteen days with our Cayenne S had taught me two major things about the Cayenne. The crash had been an education in just how tough it really was (tough, and well-prepared for the rally with five-point harnesses, proper race seats, and a roll cage in addition to its passive and active safety systems). And over 7,000 km off-road has also taught me that the Cayenne was a real Porsche with real motorsport capability, capable of sustained high-speed running on dirt tracks, up and down mountains, and across sand dunes while remaining comfortable and reliable. Purists might protest, but the Cayenne is a Porsche through and through. And now we have the new Cayenne, the third generation of one of the brand’s most popular models, and a car that will forever remain very special to me. What’s new about it? 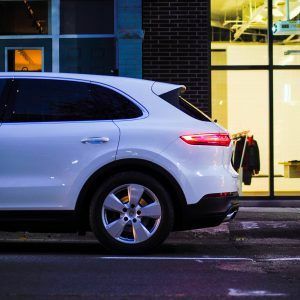 In true Porsche fashion, the exterior design is evolutionary: at first glance, the new Cayenne doesn’t look much different from the old Cayenne, with the exception of much sharper LED lighting, including four-spot headlights and a full-width light strip that is quickly becoming a Porsche signature. 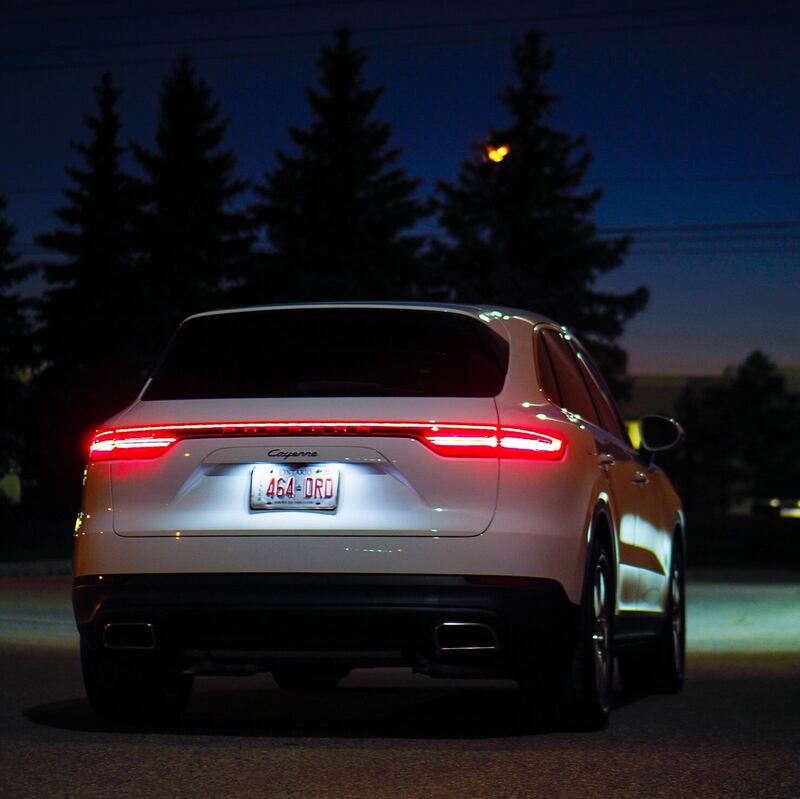 Look more carefully and you’ll notice sharper lines everywhere, and subtly reworked proportions that give the Cayenne a lower, tougher, more planted stance. Wheels and tires are now staggered-setup, like on all the company’s sports cars, with wider tires at the back hinting at the performance and handling potential. The biggest changes are under the hood. Entry-level Cayennes switch from a naturally-aspirated 300-horsepower V6 to a 3.0-litre, 335-hp turbocharged V6 that produces 332 lb-ft of torque. 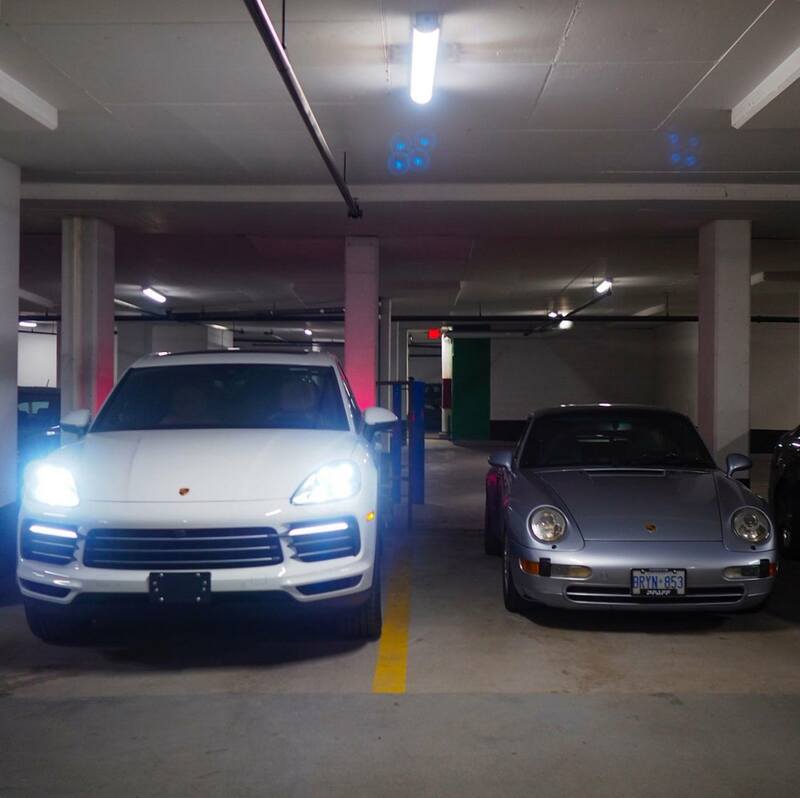 In a vehicle significantly lighter than the original Cayenne, a base model now produces almost as much power as the original S. S models now get a twin-turbocharged V6 good for 445 hp, almost as much as the original Cayenne Turbo, while the new Turbo gets a whopping 541 hp; a plug-in hybrid version is coming as well. 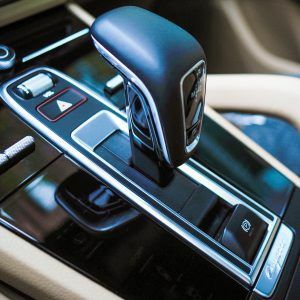 All versions put power to the road through a slick eight-speed Tiptronic automatic and Porsche Traction Management all-wheel drive; the system has the ability to freewheel during steady-state cruising in addition to the expected automatic stop-start feature at lights. While the Cayenne has always impressed with its performance – you’d expect a Porsche to be fast – the surprise has always been its handling, which is not only impressive for a five-passenger SUV, but impressive, period. The newest version is no exception. Steering response is immediate and precise, the narrower front tires helping to deliver excellent road feel, and cornering is flat, stable, and predictable well into speeds that would be a challenge in most sports cars. Thank Porsche’s careful tuning as well as chassis technology that includes features that even some 911s don’t have: you can order a Cayenne with air suspension, Porsche Dynamic Chassis Control active roll stabilization, the same rear-wheel steering that is so effective in the GT3, and more. Brakes are predictably amazing, with Porsche Surface Coated brakes now an attractive halfway option between conventional steel rotors and the killer ceramics. A full suite of driver-assistance features joins the Cayenne’s handling prowess to make for a complete package. LED headlights are abetted by available adaptive cruise control, lane keeping assistance, night vision, head-up display, and automatic pre-collision braking when the car senses you’re about to have an accident. The technology is seamlessly integrated into the new Cayenne’s command-and-control system, which features an all-new instrument cluster with analog tachometer flanked by two large screens. 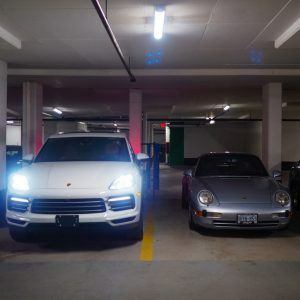 In addition to replicating the traditional five-gauge Porsche layout in their regular modes, they can be switched to show a large map view, infotainment and communication settings, and more. The console is now one giant touch panel, with backlit context-sensitive controls and a massive infotainment display; it all works beautifully, though you’ll have to carry a microfibre with you at all times if you dislike fingerprints as much as I do. These features and tech are packed into a beautifully-executed cabin that is more spacious and versatile than ever before. The rear seat is notably more comfortable, and there’s more room for cargo as well. Porsche’s build quality continues to improve with every passing generation, and the list of available leather colours, trim materials, and personal touches is longer than ever. Go crazy with the options list and you can double the base price of your Cayenne with customizations – your imagination is the only limit. All the extra goodness in the new Cayenne means that the base MSRP has jumped a bit, with 3.0T models starting in the mid-seventies. But you certainly get a lot more for your outlay in the latest version – like all Porsches, the Cayenne brings together apparently contradictory attributes into a cohesive whole: it’s faster but more fuel efficient; it’s more comfortable than ever but also more exciting to drive; it’s packed with tech, but still feels natural from behind the wheel. In short, it’s still a real Porsche, and one that justifies every dollar, every time you drive it.